Der Artikel Julie Andrews: Four Classic Albums wurde in den Warenkorb gelegt. 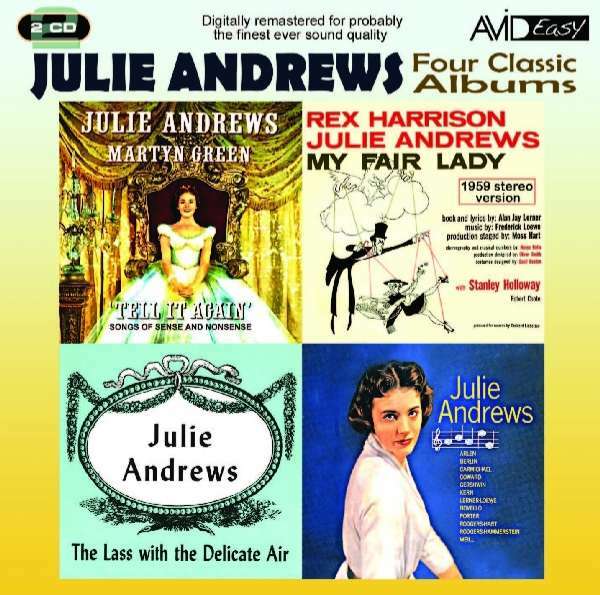 AVID Easy here presents four classic Julie Andrews albums , including original LP liner notes on a finely re-mastered and low priced double CD. 'My Fair Lady', 'Julie Andrews Sings', 'The Lass With The Delicate Air' and 'Tell It Again'. 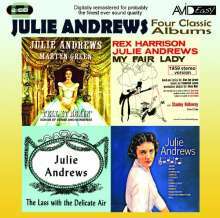 How appropriate for AVID Easy to be releasing these four classic albums from the legendary British diva Julie Andrews at this time! The 'fair lady' has just completed a sell out concert at London’s O2 Arena and her profile on screen has never been higher. Here on these four classic albums we give you the opportunity to hear Julie in her prime, from the evergreen 'My Fair Lady', here presented in the 1959 Stereo version to the childrens songs composed by legendary New York musician Moondog on the album 'Tell It Again', a stranger collaboration this writer could not imagine! We also include the hard to find album 'The Lass With The Delicate Air' available only as a high price import commanding prices as high as £40 per copy! !